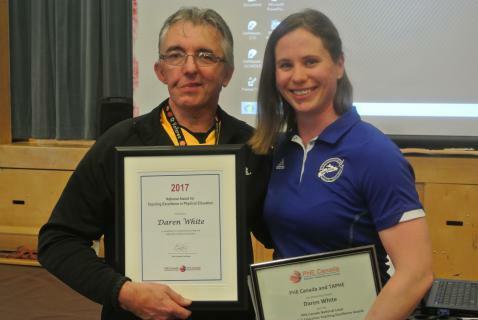 Daren White, the Physical Education Teacher at Spring Street Academy, was surprised and humbled to receive the PHE Canada National Award for Teaching Excellence in Physical Education in a special ceremony at the school on April 29th. Joined by the entire school and his family, Daren was lauded for his amazing efforts to promote physical, mental and emotional health. This is the second major award that Daren has won for his teaching practice. In 2016, Daren was awarded the Teaching Excellence Award for Physical and Health Education by the Nova Scotia Teachers Union. He is also a past Excellence in Teaching Award recipient, which is presented annually by CCRSB and the NSTU. The PHE Canada National Award for Teaching Excellence in Physical Education honours Canadian teachers who provide outstanding teaching performance at the elementary, middle or secondary levels, who have an exceptional ability to motivate students to participate in a lifetime of physical activity, and who further Physical Education in Canada.